As most of you know, my repurposed and upcycled projects usually come to fruition as a result of (a) my pickin’ adventures across the South, or (b) “shopping” from my junk stash in our garage. But this project has a very different- and unfortunate- backstory. Back in March, we received a note in our curbside recycling bin that glass was no longer accepted- no bottles, no jars, no glass whatsoever. Come to find out, it’s a county-wide issue and none of us in Greenville County, South Carolina can recycle glass! And for someone who prides herself on personal environmental stewardship, the idea of putting glass in our garbage can has caused a great deal of stress and anxiety…and environmental guilt. 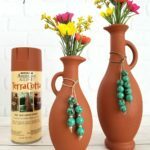 So, I decided I needed to come up with a DIY project using some of our glass bottles. I supplemented with a few from our favorite restaurant, Stella’s (because I wanted some larger wine bottles, and, well, we just never have those on hand!). No. More. Glass. Recycling. It hurts my heart!! As my project vision crystallized in my mind- something soothing, coastal, and beachy…to counteract my no-glass-recycling anxiety- I dug out a vintage milk bottle carrier from my stash. I can’t believe I’ve never used this in a project before! But it was perfect for my idea. I almost forgot that I owned this! Next, I set about transforming some humdrum clear and soda-bottle-green bottles into “sea glass” bottles…in frosty cool colors. Since I’d never done this before, I decided to try two different methods. This post contains affiliate links for your crafting convenience. The first method I tried was using a specialty sea glass spray paint (Krylon Sea Glass paint in Sea Foam) which I used on the perfectly clear/colorless and nearly-colorless bottles. And on the blue-ish bottles, I used an Etch-effect paint (from Martha Stewart…and not to be confused with corrosive glass etching cream). Note- I could ONLY find this stuff online! 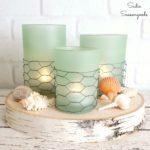 DIY Sea Glass Method #2! Both yielded truly excellent results- and they dried super quickly, even on a humid summer day. So I would definitely recommend either and/or both methods. Now that I had my bottles ready (and coated with a clear polyurethane spray to keep the frosty paint from scratching off), I turned to my vintage milk bottle basket. Not that he needed any embellishment, but I decided to break my no-burlap rule and wrap a little burlap ribbon around the inside of the basket to give it a sandy-colored foundation. Don’t get me wrong- I love burlap! But I’ve tried to avoid using it because it’s just plain EVERYWHERE these days! There…perfect- no adhesive needed, it tucked easily along the inside perimeter, and I simply snipped a little where the ribbon went under each metal divider, to keep it from bunching up. With the burlap in place, I added in my painted sea glass bottles- and was immediately smitten! But it needed one final touch- and a little nod to my favorite coastal element, sea oats. Now, you can’t pick or take home real sea oats in places like Florida and Georgia- they’re important sand stabilizers along the shore (sorry, my marine biology degree is showing). BUT, I chose as close a replica as I could find in my local craft store and plopped a few stems here and there in my bottles. Doesn’t that just look so coastal and beachy and dune-y? Perfect as a centerpiece or on a side table…bringing in a coastal breeze no matter where you live. And if you close your eyes, you might just hear the wind whispering in the dunes and waves bubbling over your sand-covered toes. Looking for more summer/coastal DIY/Repurposed ideas? Check out my other beachy projects here! Another great project, and thanks, too, for the product reviews. I love this – so pretty and elegant. My grandma use to save glass bottles under her house. She was from the depression era. When she passed on and the house was sold those bottles were left there. Somebody one day will find a treasure and perhaps create something awesome like you did here. I just love this and now a trip to the ocean would be fantastic. Oh, I dearly love the look. I live in Florida and would display this all year. Sorry about the recycling – that would kill me. But to think you took a bad thing and made it into a desirable good thing. That’s fantastic. These bottles are lovely! Yeah, I was reading and thinking, “You can’t pick those sea oats here!” I’m only 90 minutes from the beach, but we don’t go nearly as much as I want to. Go figure! It’s one of my favorite places. And, I’m currently decorating our guest bathroom with an ocean theme. This fits right in and I’m so inspired to get myself some paint and a lovely little crate somewhere…it’s time to head to the thrift store. Sarah, I just love what you did to transform the bottles! And I hate to throw them in the trash too, but we haven’t been able to recycle glass for years. Liquor bottles are always so pretty anyway, but love how you made them prettier with the paint. Pinned to “Shabby Chic and Antique” board. You can get the same sea glass look by mixing Elmers Glue and food coloring. I paint it on the bottles with a foam brush. Tie a little raphia around the neck and glue on a seashell or two. Beautiful!! Plus if you get the bottles wet the sea glass just disappears!!! Anxious to try the paint! That’s crazy! Here, they ‘recycle’ glass, but it gets crushed and thrown in the landfill. How short sighted. Thanks for the great project, I had no idea that paint even existed! Uggggh, crushing it and dumping in the landfill is no better!! Boo, hiss. But YES, both paints are pretty awesome, I must say! That’s what I thought when I heard that. How are we supposed to save our planet with idiots like that? I guess by using all the scraps and thrown out stuff we can for crafts! It would be torture to me if I had to stop recycling glass!! I guess they can’t source it out at this point. You are so smart to make something beautiful from your leftovers. I’d be using bottles and glasses for storage too. What a great display! Love the look of your bottles and that container is awesome. So pretty. Thank you so very much, Bev! Looks beautiful, the bottles came out so pretty! I used to love finding sea glass on the beach when I was a kid. Such a treasure! Aww, thank you!! And the bottles were PERFECT- especially the big ole’ wine bottles. 🙂 See you soon! You must be from the South. My favorite expression is big ole whatever which defines something that is much bigger than big!! !😁Smiling here! Drink more wine, it’s good for you! Just wondering though, can you not take liquor/beer bottles back to the store for a refund? She has done it again! Another easy super cute tutorial! I have got to try that spray paint…I didn’t even know there was such a thing! These look so good!! Thank you, Chris!!! Yeah, both paints are pretty darn awesome- I gotta say! It’s a statewide problem in South Carolina- all the processing facilities have closed because it’s not cost effective. 🙁 I’ve heard it’s becoming a nationwide problem, as well. Way to make lemonade from lemons! Your bottles are gorgeous. Maybe you can make potion bottles for Halloween, as well? I’m right there with you … it would cause me extreme anxiety if I couldn’t recycle. Thanks for sharing! I love this effect, I had no idea this kind of paint even existed. We are lucky that at the moment we still have glass recycling here but reusing is always better anyway isn’t it as a first option? Very, very true- thanks, Julie!! It looks great! I’m also playing with glass bottles these days. Sarah, I absolutely love your solution to the no glass recycling problem. We always have bottles to recycle and I have a similar wire basket. Definitely trying this project. Thank you for sharing at Your Inspired Design LInk Party. I have not ever heard of sea glass spray but I will be trying this soon. I love how these bottles turned out. This is a great upcycyle! Gorgeous! I have some of that paint but haven’t tried it out yet. Now I’m really excited about giving it a try. We’d love to have you share this at our weekly link party. http://www.thelifeofjenniferdawn.com/2016/06/farmers-market-meals-and-little-bird.html Hope to see you there! Done and done- thanks so much! What a great idea! What kind of camera do you take your pictures with? Love the quality! Thanks, Christa! Believe it or not, I use my phone (Samsung Galaxy S6). I LOVE how you transformed these ordinary bottles. So clever!!! You are so resourceful. The bottles are now beautiful. I’m in love with everything ocean-inspired. I didn’t realize you could buy a spray that would create that look on glass! LOVE it! Saving to my Handy Tips board so I can try it someday! Yes, ma’am, pretty awesome stuff!! I love, love, love this project! I am a sucker for a single flower ( or sea grass but we don’t have that in Wisconsin) stuck in a bottle. These are gorgeous and I am totally going to steal this idea. I didn’t even know they made sea glass spray paint! Thanks, Michele- Borrow away! All I ever ask is that you mention & link where you saw the idea. 🙂 Happy 4th! The colors really caught my eye. To think you did it with the paint. Excellent project. I thought both types worked very well and the milk crate adds to the perfection. I love that it’s something new made out of something old and beautiful at the same time! Recycling blues, they just gave approval to a land fill near me to make it higher and it’s on a top of a hill that goes directly down to the river. I love the outdoor beauty so much that I just don’t understand when others don’t care and to that extreme level. It comes down to money. Anyway, next time I go to the craft store I will be getting some of that paint! Ugghh!!! I hate to hear that, Patty! I love this! So gorgeous and elegant, and such a great way to use up old bottles. Oh how cool Sarah, I love how these turned out! Can’t believe you can’t recycle glass! But hey, at least these didn’t end up in the garbage then and you made them beautiful! That milk bottle crate is amazing too! Thank you so much, Christy!!! Thank you so much…and that’s horrible that you can’t recycle ANYTHING? And BTW, throwing out glass is actually better than any plastic because it was made with sand and not petroleum products…so it won’t leech anything into the soil and water. But it’s still hard to throw out for me!! What a great idea to recycle glass into such beautiful decor! Love them! Pinned to share. Thanks for linking up with us for Snickerdoodle Sunday! Love this project, and an adorable vignette! Thanks for sharing your process. Great idea! I love the sea glass color. This set turned out gorgeous! We are so happy you stopped by and joined Dishing it & Digging It link party. We love having you. Enjoy your day! Buy 20 cans of sea glass spray paint | Paint everything glass in site. Check! Added to my to do list. LOL Loving this project. I can’t believe you can no longer recycle glass?!? It is the easiest thing to recycle! That’s criminal. You should be proud of finding such a beautiful way of repurposing those glass bottles. Oh my gosh, I know!!! It’s just horrible…we’re much more aware while shopping now…if we can purchase something in plastic or aluminum, we buy it instead. Grrr!! I’ve never seen sea glass paint, but I’m going to get some! I love this idea – thanks for sharing on the Pleasures of the NW’s DIY party! I absolutely LOVE these. We can recycle our glass, but I am going to start being very picky about what I put out and what I save. These would be perfect for our coastal look at home! Thanks for sharing at Celebrate Your Story! You are so right about burlap but it was perfect in your sea glass bottle project. Thank you for sharing your beautiful project and tutorial at Vintage Charm. So great! I just share to my favebook page Feathering My Nest for my followers to checkout too! Ut-oh I so need that Krylon Paint! I did not know they had this! Awesome!Thanks for linking up to Merry Monday! Sharing on FB! Have a great week! I just put that paint on my shopping list! Love how this project turned out.We don’t have recycling in our county at all. Pinning. To say I’m in love with these would be an understatement!! I’m going start drinking more now in anticipation of doing this project!! Hahaha, I love it- thank you so much, Mollie! Swingining by for Talk of the Town, I’ve been seeing these bottles all over the internet this past week…SO ADORABLE! Thanks for sharing your technique! This is such a cute DIY! Those bottles are beautiful! Thank you so very much, Jill! Sadie… you’ve gone and done it again! Girl you are such a creative genius! LOVE this! I hadn’t heard of this frosted glass paint! MUST get some now!! How do you get the labels off the bottles? Hot water and a dull steak knife (that is dedicated to this kind of work). Thank you so much, Lori!! Who knew something so simple would turn out so wonderfully?? Such a perfect summer project Sarah and a great way to recycle. I need to get my hands on some of that Sea Foam spray paint for sure. We’ve never been able to recycle glass and the list of no-no’s is steadily growing. This looks like very high-end decor that would cost a fortune and yes I’m feeling a little beach-y dune-y. What would you use on antique brown glass Clorox bottles? LOVE this project, Sarah! I’ll be featuring it tomorrow night at Best of the Weekend! Woohoo!! Thank you so much, Amy- I’ll be there! Looks great. By the way if you have Micheals craft store where you live you can buy the Martha Stewart there. I looked at both of my Michael’s in the Martha paint section and couldn’t find it! That’s AWESOME that your store carries that exact paint!! I didn’t know that sea glass spray even existed! What a stunning transformation! I share your anxiety about not being able to recycle glass! It never goes away in a landfill. My recycling toter is 30 gallon so feel free to top it off! HA! Love your upcycle too! What out, Pam- I might just be knocking on your door with my glass jars!!! This is gorgeous, Sarah! Thanks for sharing with us at Snickerdoodle Sunday. This is the Most Clicked link from last week’s party and I’ll be featuring it at today’s party. No glass recycling in my neighborhood here in GA! I also was very upset when we got the notice a couple of months ago. Glass is the perfect material to recycle. However, your sea glass idea is beautiful! Apparently glass is considered a plentiful commodity and is therefore not economically advantageous to recycle. My concerns are the landfills filling to the max. Thank you so much- I think you’ll be pleased with the outcome! I can solve your sea oat dilemma. Go to your local nursery and buy a pot of Northern Sea Oats. Plant it in your garden or a pot and you’ll have a yearly supply of sea oats. They reseed and spread. I live in No. GA and mine are prolific so I know you’ll be just as successful in SC. I had no idea, Vicky!!! Those look wonderful…thank you for the suggestion- seriously! Oh, and thank you for introducing me to sea glass paint. I’m definitely going to get some and get to work. I think that I can easily turn some glass Christmas balls in to Japanese fishing floats in no time! I’m very fond of sea glass and have quite a bit in a huge bowl. I just know those fishing floats look great mixed in with the glass. Ohhh, that sounds like a LOVELY idea, Vicky!!! Wow, I’ve never seen the sea glass paint before. Since I have a small collection of real beach glass, now I know I can make some bottles to match. Your display is lovely! What a fun project! I love spray paint! These really look authentic. Thanks for sharing at Welcome Home Wednesdays! See you tomorrow! Hi! We’re going to be staging our house to sell in the next 6 weeis – this will be the perfect accent for our kitchen counter~ I love this. OOOH, great idea!! Thank you so much! They are beautiful! Can you use regular krylon spray paint? Well, darn! We don’t have any glass recycling facility nearby either (I’m in Mississippi, a SC transplant!) but Target trucks the glass out for recycling. Such a bummer, right?? But I wonder if I could find out more about what your Target does…and see if I can connect the dots somehow. That would be amazing! How did you get the stickers off of the glass? Hi, Minnie- I soaked them in hot water and scraped them off with a dull steak knife. I LOVE your recycled bottles!! What a great idea. I do have a question. Did you have a sure fire way to remove the labels and more importantly the label GLUE from the bottles before you paint? I find it next to impossible to get all that stubborn stuff off. Thanks! It’s such a pain, right?? I used running hot water and a dull steak knife- it’s a pretty good combo for getting the labels (and glue) off! This is gorgeous! gotta look for some of that sea glass paint. I love the different shaped bottles, so now I’m going to need start collecting! Feel free to run over the border to NC to recycle! I live in NC, about 1 and 1/2 hours from Greenville! Love all your crafts. Thanks for sharing. HAVE to do this one !!!!! BEAUTIFUL !! Thank you so very much, Laura- you won’t be disappointed! So simple and doable! Thanks for posting! This is a long shot, but do you remember where you bought the carrier? I do remember, but I’m afraid it won’t help you- I bought it at a flea market in Asheville, NC. Not exactly one-of-a-kind, but I rarely see the vintage ones like this anymore. I love the idea. I don’t drink,but we have a small pub down the street. Going to ask them to save the bottles for me (empty of course ). I know they throw away tons. You can hear them crashing as they go into the garbage truck. I guess that’s one way to support my local pub. Maybe I can go into business. I will mention your site of course. Thank you so much. I love the sea glass bottles! I am going to use this idea for my friends beach themed craft room I am decorating for her. The basket is so cute too! Where did you get it? I have seen “vintage wire” type baskets at the craft stores but not one that looks like yours. Great job! do you think this idea could be used on glass bathroom accessories? Like toothbrush holder, lotion bottle, etc? I can’t find what I want in stores, so thought about making my own. Thanks! Absolutely, I don’t see why not. But it does scratch easily- so be sure to put a couple of coats of a sealant to help protect it. That’d be my only concern with bathroom accessories (since they’re moved, picked up, etc.). Wow, they look amazing! I love how you styled them too. Will be sharing this on The Creative Circle Link Party this week. Thank you for linking us with us! I love this idea and am thinking I would like to use it on old wooden window panes with ocean pictures of my sweeties on it. My mind is just churning. My husband will not thank for this but I will. We can still recycle glass in Charleston, SC…. I’m so jealous that y’all can still recycle in the lowcountry!!! I live in NC so you can drop some bottles off anytime LOL! I love the color of seaglass and need to try that spray paint to recreate this look! On your sea glass decor, what other colors did you use? you only show one color. Can you let me know the other colors you used? Thanks! Just the one sea glass spray paint and the frosty brush-on paint. The bottle glass themselves were different hues, which shows through the paint enough to give them all slightly different looks! Hmm, I’m not sure- mine were always frosty and textured, just like real seaglass. Not rough, but certainly not glossy smooth. This is lovely, Sadie & so calming. I didn’t know that about sea oats–interesting! !